The future of cancer immunotherapy is rooted in research and education, primarily by early career scientists. The Forward Fund was established by the Society for Immunotherapy of Cancer (SITC) in 2012 to stimulate the future of science, development and application of cancer immunology and immunotherapy through financially supporting its education and research. Since its inception, SITC has strongly supported the growth and achievement of young investigators in the field of cancer immunotherapy. 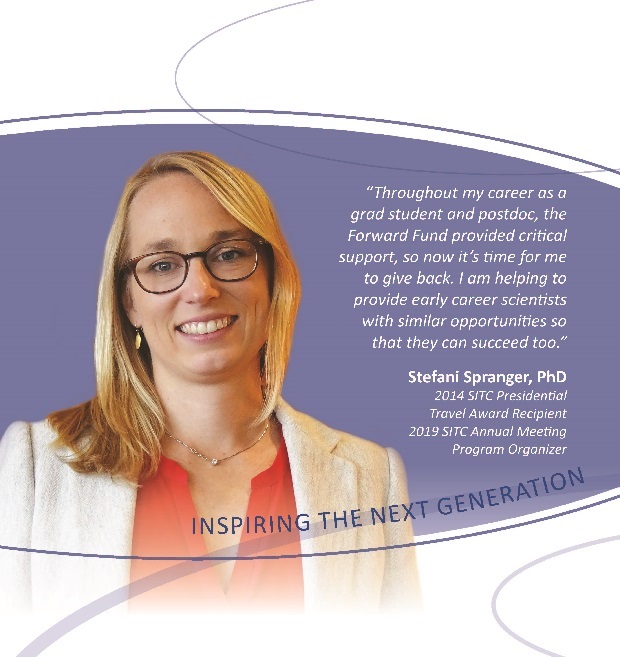 As the field continues to expand, SITC has realized the event greater importance of fostering the growth and development of the next generation of cancer immunotherapy experts and tumor immunologists by providing them with additional support opportunities. Learn more about the SITC Fellowship Awards. 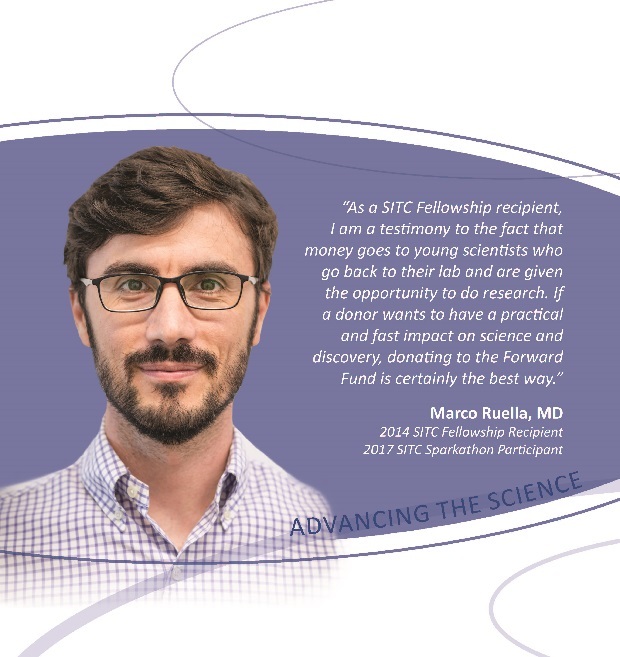 Listen to Dr. Marco Ruella, 2014 Fellowship Recipient, share how the Forward Fund influenced his career path. Presented since 2005 in memory of the society’s founder, the Richard V. Smalley, MD Memorial Award and Lectureship is the most prestigious award offered by SITC. The award serves to honor those that have been pioneers in their work and have made a notable impact worth of high regard and recognition by their peers. SITC offers awards to promote growth and achievement among young investigators in the field of cancer immunotherapy and to recognize excellence in SITC Annual Meeting oral abstract and poster presentations. Listen to Dr. Stefani Spranger, 2014 Presidential Travel Award Recipient, share the pivotal role the ForwardFund played in her professional development. Contributions in any amount to support the mission and efforts of the Forward Fund are welcome and appreciated. General contributions, tribute and memorial gifts can be made online or by completing and returning the printable pledge/contribution form. For estate gifts, honoraria transfers and named honor funds, please contact SITC staff at development@sitcancer.org. SITC offers a wide array of opportunities for corporate partners to engage with the society and interact with members and meeting attendees alike. Click here to read more about how your organization can support the society. Launched in 2017, the SITC Sparkathon program aims to bring together young investigators of various backgrounds, degrees and professional experiences to collaboratively solve hurdles facing the field of cancer immunotherapy. The first SITC Sparkathon class Met in August 2017 during a two-day retreat in Chicago where they competed in teams for funding to implement their innovative projects designed to solve a hurdle facing the field. Two projects were selected: Teams TimIOs and the METIOR Incubator. Both groups will present their findings during the 33rd Annual Meeting & Pre-Conference Programs in November 2018. In September 2018, the 2018 SITC Sparkathon class met in Chicago for a similar retreat. Learn about this class and follow their progress by visiting the SITC Sparkathon webpage on SITC CONNECT. 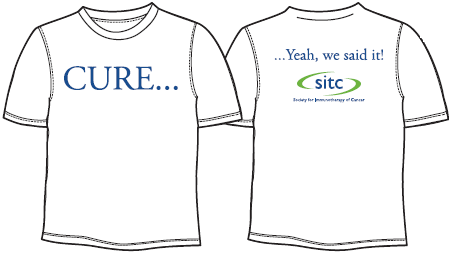 Show the world you're serious about cancer immunotherapy research by wearing a SITC CURE t-shirt. Order shirts online or download an order form by clicking here. When you shop via Amazon, consider using the society's AmazonSmile account. When shopping via this link, Amazon will donate 0.5% of the price of eligible AmazonSmile purchases to SITC.